The other day, doing another stream survey, I got a sense of what an ivy forest might look like. We’ve all seen ivy on the ground, where it “should” be — the roots are shallow, the vines thin. You can easily pull up great stretches of English Ivy. This can lead to what I call “ivy madness”, as you get wrapped up in pulling a root and it leads you 10 feet or more away from where you started. 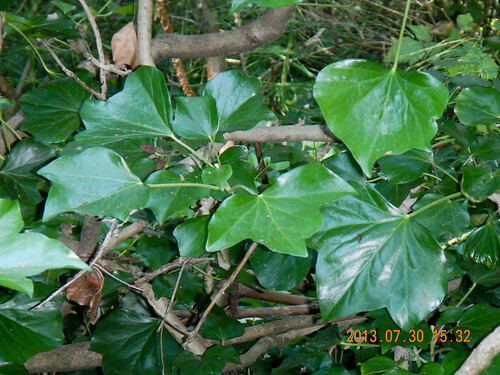 In an unmanaged park, ivy can establish monocultures. This photo was taken in 2011, before any work had been done in North Beach Park. The ivy has covered the ground and suppressed all native plants. It was climbing the trees and would have reached the crowns soon enough. That’s what ivy does. It’s quite happy scampering along on the ground, growing (I’ve heard) up to 7 feet per year. It can also survive in such low-light conditions it can’t be shaded out. If it hits an obstacle, such as a tree, it grows up towards the light. Once the ivy reaches the crown, it gets enough sunlight to flower and fruit — well out of reach of human intervention. Pollinators go for the nectar and birds eat the seeds. If beetles or pollinator larvae at the leaves, we might not have as much of a problem with it. As the ivy climbs the tree, the roots thicken and develop ugly, centipede-looking root hairs that grip the tree. 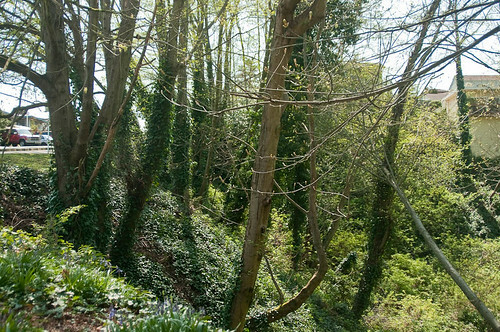 The ivy doesn’t parasitize the tree directly, but the weight of the mass of ivy slows tree growth, and the leaves create a great sail that can bring a tree down in winds it might otherwise have survived. 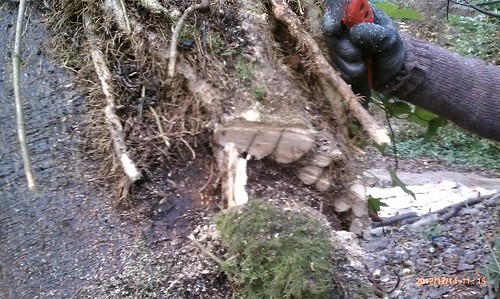 Here is what some ivy roots look like cut through. They are far from the thickest we’ve seen in North Beach Park. I remember when we cut through these roots they snapped with quite a loud crack. 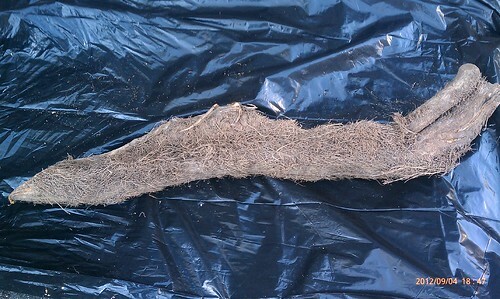 This is one of the thickest ivy roots from North Beach Park. For scale, that’s lying on a 50 gallon lawn’n'leaf garbage bag. But the other day I saw a new form that made me think this is what an ivy forest would look like. I was at the base of a slope that enclosed the Headwaters Bowl (a large wetland where most of the water enters the park). There are few trees growing in the bowl itself as it’s too wet. On the slope there are old trees, but the few saplings aren’t enough for succession. But at the base of the slope, where I was, there were a number of logs that had fallen into the bowl. They were covered with thick ivy vines, still rooted into the ground. 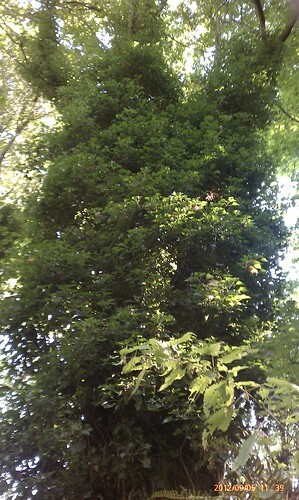 The ivy was growing out into the sun and receiving direct sunlight for most of the day; there was very little shade. Note how smooth the vines are — no need for the centipede hairs, I guess. And look how different the leaves are — thick, leathery, almost completely filled in. This is what it looks like at the crown of trees. Just as on the ground, it still twines all around and about. However, these vines are thumb-thick and thicker. They form a more solid thicket than blackberry (you can cut through blackberry with a machete, but this would take a saw). Almost as dense as holly, but less prickly. I think the ground is too wet for the ivy to root, and most of the rooting happens on the slope. 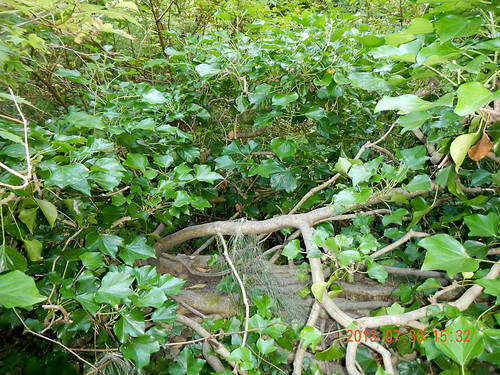 This might make it relatively easy to make a serious dent in this ivy, by cutting it from the logs as if we were making a horizontal survival ring.